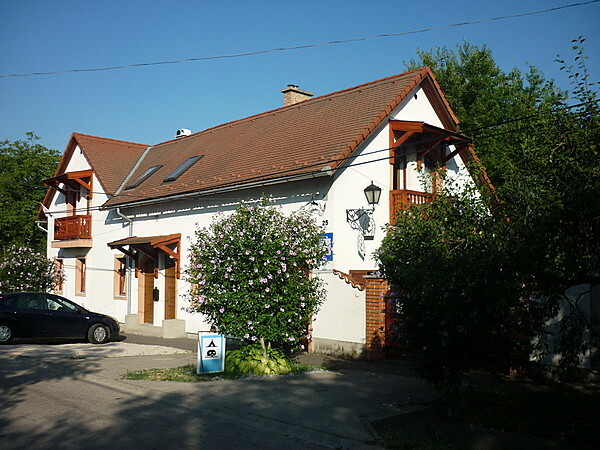 This friendly guest house and camping is located in the greenbelt around Budapest, just on the way for those coming from Western-Europe. Situated within a beautiful scenery 20 km from the center of Budapest, the site has a good transport connection to the city center of Budapest (highway, bus, train), to the western highway M1 to Budapest and Vienna, to the south-western highway M7 to Lake Balaton and Croatia and to the ring highway M0 to South- and East-Hungary, Serbia and Romania. The mentioned highways are within 5 km. It unifies the strong points of being close to Budapest, but still on the green countryside. Biatorbágy is a little settlement near (2 km) the M1 motorway (Vienna-Budapest), with beautiful landscape and lot of green area, also with good infrastructure and clean environment. The campsite is one among many surrounding gardens with 12 places for caravans and tents. It is open from May 1st until September 15th and it is wise to make a reservation. Following reservation in advance and a confirmation, the owners are happy to welcome guests on the campsite also apart from the mentioned opening hours. The apartments and rooms are all-the-year leasable. Sanitary block with nice and clean bathrooms, toilets are available. There are nice freshly built rooms in the family house, a typical two storey family house and terrace situated in a nice and quiet garden. One five-bed apartment (with 2 rooms and a kitchen), three two-bed rooms and one single room are available with separated and common bathrooms, a common room with kitchen and a winecellar. The atmosphere is very nice and the family is hospitable and experienced with international tourists, speaking many foreign languages. Bakery service and table tennis are available. As part of the services, sightseeing programs to Budapest and the Hungarian countryside are purchasable. In the surroundings are several similar gardens with family and weekend houses of 2100 sqms average size. Hilly landscape with a lot of green area. They offer you a range of programs including visiting a wine cellar in Biatorbágy; making a tractor tour in the Etyek wine region combined with wine tasting, where the host serves a rustic plate of traditional Hungarian specialties; making a horse carriage ride combined with wine tasting or participating in beer tasting in a beer brewery in Etyek. There is also a chance to visit the biggest film studio of Europe (9 km from the guesthouse/campsite) or participating in a chocolate tasting.